Printing labels on your laser printers for the first time can be a daunting task or it can be so easy! Sometimes all it takes is: just fill out a template formated for labels in sheets with your information – just print, peel the laser labels and then apply them. But several things can go wrong from old toner, dirty printers and many other things. Even experienced label printers can have a rough time, so do not feel alone. Read the following, and hopefully the answer to your problems printing laser labels will be solved. It is best to refer to your printer manual for loading and feeding recommendations. Many printers have special instructions regarding the direction in which you should load sheets. Before you print onto a label sheet, first print onto a blank piece of paper. Place the printed sheet behind the label sheet, and then hold the sheets up to a light to make sure the positioning is correct. If you find your toner is flaking or easily rubbing off, please try selecting “Labels” or “Transparency” in your printer settings as the media type as opposed to paper. These settings are normally found in your print options on print dialog box when you push print or they are located in the display screen on your printer. 1) Reducing your printer’s DPI resolution may give the label sheets a better quality finish. 2) Sheets of laser labels can be passed through a laser printer only once because the heat of the printer causes the adhesive to soften. If a sheet of labels is passed through the printer a second time, the adhesive could ooze and adhere to the inner workings of the printer, causing the labels to jam or peel off. 4) Smudging toner usually comes from defective toner cartridges. It is easily solved by replacing the cartridges. 5) Flaking toner can be solved simply by adjusting the printer settings to reflect the material type of labels you are printing on. 6) If your paper won’t feed through the printer the rubber on the printer rollers has probably worn down and lost its grip, or the printer rollers are dirty. 8) Alignment issues can be a nightmare: Make sure your text or image is at least 1/8″ away form the edge of the laser label. Printers can experience “paper-shifting,” which causes label sheets to move around in printer trays. This can cause designs to be printed a little off-cue. Here are a couple of fixes: Make sure your label sheets are properly loaded into the printer. To do this, confirm that all sheets are tightly squared and level, both lengthwise and across and in a neat stack. 10) You might have to print all the way to the edge of the laser label. Some printers have a “non-printable margins”. Check this off before you start creating and printing our laser labels. Please remember, first print on a plain paper and trace it over the label sheets to make sure everything is aligned. 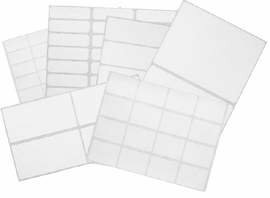 WARNING – Store all label sheets flat and avoid sunlight! This entry was posted in Labels & Printing and tagged labels, laser labels on October 27, 2010 by wlmanager.